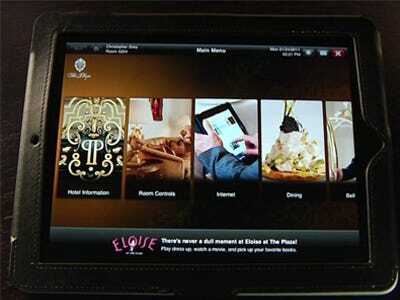 It was the must-have amenity of 2010, and now the iPad is making even deeper in-roads on the hotel landscape with The Plaza‘s announcement that it will move most basic concierge services to a fleet of in-room tablets, supplementing the hotel’s already extant Palm Court loaner ‘Pads.The gadgets will be pre-loaded with The Plaza’s custom-built app, designed to integrate with the hotel’s backend for services, says a release. Like what? Ordering in-room dining; making dinner reservations; arranging beauty and spa appointments to coordinating transportation; getting tickets to the hottest show in town; making housekeeping requests and much more. The debate between old-fashioned personal assistance or the tech solution is one we’re seeing across brands. Hyatt, for its part, is equipping its concierges with iPads, getting the devices in front of guests without loaning them out. InterContinental has developed its own app that even non-guests can tap for tips. And The Cosmopolitan in Vegas has iPads embedded in the check-in and concierge desks for multimedia driving directions or flight info lookups. The more the merrier, we say—just make sure there’s a convenient plug in our room for recharging at the end of a long, geeked-out day. Intelity’s ICE Touch Premiers at The Plaza Hotel from Intelity on Vimeo. This post originally appeared on Hotel Chatter.